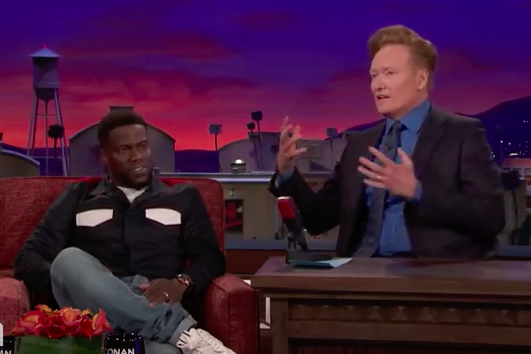 Kevin Hart joins "Late Night with Conan O'Brien" on Monday, March 5, 2018. When you are Kevin Hart, there are only a couple of things in life you can't do. You can't reach the top kitchen cabinets and you can't get on stage with the Super Bowl champion Philadelphia Eagles to hold the Lombardi Trophy. We're all aware that Hart got bombed in Minneapolis and tried to crash the Eagles' trophy presentation, only to run into a gigantic security guard who wasn't having any of it. He later appeared on television during a Fletcher Cox interview and shouted obscenities. Hart sort of apologized for his drunken conduct in an Instagram post and later took a little ribbing on the internet, notably from old friend Shaquille O'Neil, who said the North Philly native must be an alcoholic. Appearing Monday night on "Late Night with Conan O'Brien," Hart divulged the full, blow-by-blow account of his ill-fated march down to the field on that rapturous Sunday night. He was, in his own words, too drunk to realize that several Eagles players were literally shouting at him to take a picture with the trophy. For context, he had imbibed something like 11 drinks. "It was one of those things where, you know, you get this thought, and nobody else is a part of the thought, but I had a look in my eyes that I've never had before," Hart said. "My wife was like, 'What are you doing?' And I was like, 'We need to go down with the team.'" Hart played the "I'm Kevin Hart!" card all the way into the Eagles' celebration. The only thing standing in the way of his big moment, he revealed, was himself.